Hi, hope you can help. 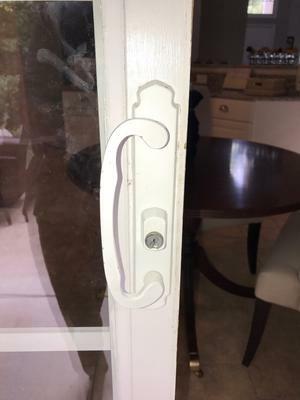 The inside handle of an MW patio door locking handle broke at the inside locking latch mechanism. The door handle is from about 1996. 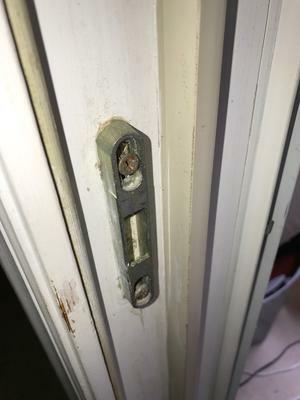 I have included pics of the inside, which is broke, and the outside which is ok.
Any chance you can measure the distance between the two screws that hold the inside handle on ? Does it look like 3-15/16 inches center to center ? What happens when you turn the thumbwheel, does the latch just stay inside the door. My contact information is at the bottom of the home page at www.fixingscreens.com if you need to speak to me about this. Hi, thanks for getting back. Sorry it took so long for me to reply. I just measured the inside handle, center to center of each screw, it is 4 inches. I took out the lock to see what the inside handle that twists to lock to the frame which broke off looks like, it has/had about a 2 inch flat straight piece of metal that just went into a notch to engage the actual lock. If I stick a flat head screw drive into the hole, it will go into the notch, and I can turn to engage the lock. I wonder if I can get just that turning piece with flat metal attached, or the entire locking metal screwed within the door. I have a few more pics, not sure how to add them in, I will try.